Home/News/Cypress Cove renovations underway by R.D. Johnson Construction, Inc.
R.D. 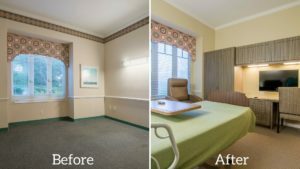 Johnson Construction, Inc. has started construction services for the interior renovations of the existing resident rooms at the Lodge in Cypress Cove Retirement Community, which is located at 10500 Cypress Cove Drive in Fort Myers. R.D. Johnson is in the process of renovating 64 resident rooms, with up-to-date equipment and modern design upgrades to each space. The renovations will include all new flooring, casework, wood trim, painting, acoustical ceilings in the restroom, electrical devices, light fixtures, plumbing fixtures, shower units and new toilet accessories. The project will be completed four rooms at a time, and each room is approximately 260 square feet. After recently finishing the seventh set of rooms, R.D. Johnson Construction has completed a total of 28 rooms. R.D. Johnson’s Matthew Johnson is the project manager, Chrissy Zimmerman is the project manager assistant and Michael James is the project superintendent. The architect for the renovations is SFCS Architects. Based in Southwest Florida, R.D. Johnson Construction, Inc. is a full-service construction management and general contracting firm serving businesses throughout Florida. R.D. Johnson Construction, Inc. is committed to making a lasting impact in the community by providing quality construction practices from start to finish with every project. The company specializes in the construction and renovation of commercial, government, educational and health care facilities and has extensive experience in the development of a wide range of small to multi-phase projects. R.D. Johnson Construction, Inc. is located at 15800 Brothers Court, Suite 8 in Fort Myers. For more information, call 239-489-0930, email info@rdj.construction or visit RDJ.Construction.